I'm Here! is a great utility that lets users share their location live on a Google Map with family, friends and colleagues. The site uses Fire Eagle to update users' locations. Registered users have full control on the sharing of their location with other members. They can also choose how they wish to use the utility. For example, the site could be used to share current activity with friends and colleagues or it could be used to track a child. It could even be used to organise location based games. Because this application uses Fire Eagle it may meet that service's request quota at times. If that occurs users cannot sign in. SakMap calls itself 'the Swiss army knife of Maps'. This is a pretty good description as SakMap seems to contain an infinite number of tools and it fits neatly in your pocket (or it would do if they released a mobile phone version). First-up, SakMap is a handy reverse geocoder. On first visiting the site the user is presented with a single marker on a Google Map. It is possible to drag the marker anywhere on the map and get the address for that location (US only). The user can then view overlays for the zip code area for that address or the county boundary. That is just the start of the information available from SakMap. It is also possible to view the weather at your chosen location, view the location on Virtual Earth and query Yahoo GeoPlanet for nearby places. And if that is not enough, you can also open a Google search for your location, open Google News, view Flickr photos of the location, read the Wikipedia article about the location, view videos and retrieve census information. Tripcart is an online travel guide and tour planner. 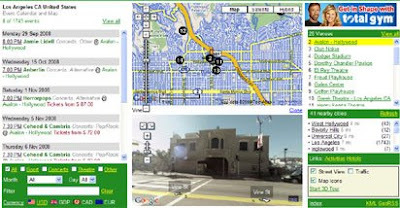 It is possible to search Tripcart's Google Maps for information on cities and attractions across the United States. The Google Map for each location or attraction contains a wealth of information. 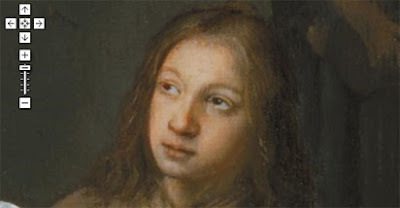 The information is available in a number of layers that can be added to the map. The information comes in a number of categories, such as hotels, points of interest, shopping, sports etc. Once you know out where you want to go you can plan your trip on Google Maps with daily itineraries. When you are happy with your itinerary you can even print everything out for easy access to all your travel plans. What Do You Do Now? 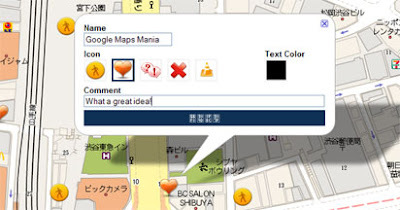 is a Japanese Google Map mash-up that allows users to leave short 'Twitter' type messages on top of a Google Map. It is possible to leave a message on any location on the map and to respond to comments left by other users. To leave a message the user just clicks on the map and an information window opens with a form to enter the message. The user can choose from a number of different types of map marker, e.g. a heart or a cross. The user can also define the colour of the font. When the user has finished typing their short message they press submit and a marker appears on the map. Map Channels Events is a huge new Google Maps music and sporting events mash-up with tens of thousands of events displayed at thousands of venues around the world. The site includes an interactive event calendar and displays each of the event venues on Google Maps. It is possible to search for events by name, category, date or location. The site includes ticket price comparison, city tours of attractions and the ability to view venues with Google Street View and the Google Earth Browser plug-in. Best of all, when you find an event you are interested in you can then buy your tickets there and then from the Map Channels site. This is a hugely impressive Google Maps mash-up, not only for the huge number of events and event venues that are displayed but for the added features, such as Street View and the 3D tours via the Google Earth plug-in. Apparently one of the reasons that the application is proving so popular is that when you light the flame on your iPhone your location appears on this map. Smule ranks the cities of the world by the number of 'kilojoules' burned each day. Currently Tokyo is leading the way with over 1000 'kilojoule's'. 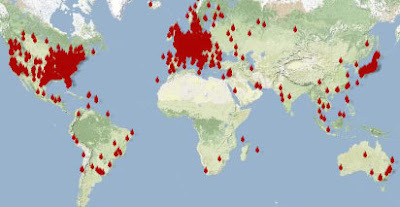 Since its launch on the 15th September there have been 68,514 unique ignitions representing 3,977 unique locations across the globe. Which just leaves the question - Why? Someone buy me a Wii! I want this! A Japanese developer has managed to hack together Google street view with the Wii to create a jogging game. Check out the video below and if you are impressed you can download the code at Google Code. Try to run on the google street view like a jogging game of wii fit from katsuma on Vimeo. You can try Street View jogging with just your fingers here. Do you have plans to move planet? 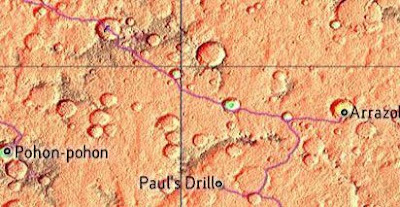 If so you might like to check out this modified map of Mars. As I understand it before the Large Hadron Collider broke last week it briefly created a black hole. The hole only existed for a couple of picoseconds, but just long enough for this website to travel back in time from the year 2208. Modified Mars is a Google Map of Mars showing the planet after it has been terraformed. 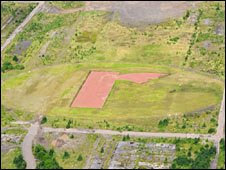 This week a huge red letter 'r' the size of 10 football pitches has been unveiled at the site of the former Ravenscraig steelworks in Motherwell, Scotland. The artwork depicts Ravenscraig's corporate logo. Murray Collins, of Capella Group, which is managing the Ravenscraig project, said: "The popularity of web-based satellite maps such as Google Earth has led to the growing phenomena of 'earth art' like the big 'r'." Why not take advantage of the new advertising opportunities opened up by Google Maps? My roof is available at very reasonable rates. 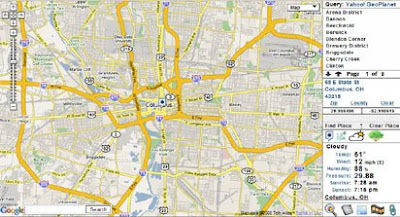 Google Maps guru Mike Williams has produced a spinning Google Map using the Google Static Maps API. If you are interested in the development of Google Maps mash-ups Mike's Google Maps API Tutorials are one of the best places to start. Google have produced an interactive timeline of Google history for their tenth birthday. If you think that the idea seems familiar, you're right it is! Back in July the Google Lat Long team produced an interactive timeline with a map to celebrate the third birthday of the Google Maps API. I prefer the Google Lat Long timeline, however the fact that they included all of the over 1500 posts that have appeared on Google Maps Mania in the timeline means that I'm more than a little biased. Google Map Maker, which allows users to contribute and edit Maps data for regions around the world, is now available in 77 countries. The vaes9 blog contacted me today to say that they had noticed Map Maker was now available for the Philippines. I checked Google's Countries Editable in Google Map Maker page and it seems that Armenia, Azerbaijan, Bangladesh, Bhutan, Cambodia, Iran, Kazakhstan, Kyrgyzstan, Laos, Mongolia, Myanmar (Burma), Nepal, Philippines, Sri Lanka, Tajikistan, Turkmenistan, Uzbekistan have all been recently added to the list. 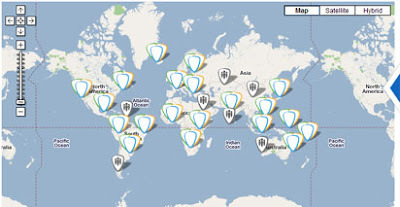 If you live in any of those countries you can now get mapping at Google Map Maker. Earth@Sg have produced an amazing Google Earth browser tour of the Singapore Grand Prix race track. The Grand Prix is set to get under way tomorrow (the actual race is on Sunday) so you can familiarise yourself with the track before all the action starts. Earth@SG have created 3D models not only of the race track and the surrounding buildings but have included superb details such as 3D trees. The site also includes a number of fly-to visits to some of Singapore's more significant buildings, including informative articles from Wikipedia. 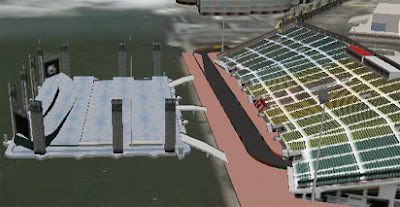 Turn 18 (pictured above) takes the track straight under Marina Bay Floating Stadium Stands. The best seats are the ones just above the track with an amazing view of the cars shooting past underneath. If you wish to check out turn 18 and the rest of the track you will need to have the Google Earth browser plug-in and be using Windows. You can also view the track in Google Earth - the Google Earth Blog has a link to the Google Earth file. The map can be dragged with the finger and zoomed with the double finger pinch action! You can read more about Alistair concept's on his blog One Wheeled Bicycle. 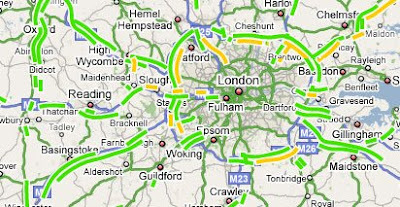 Google have added traffic data for England today. Traffic information at the moment is limited to motorways and major A roads and all traffic stops at the borders of Scotland and Wales. 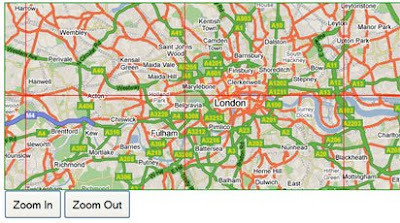 The traffic tool with Google Maps comes with two options, 'live traffic' and 'traffic at day and time'. The live traffic option is self explanatory but the 'traffic at day and time' option lets the user check a particular time predicted against past conditions. Google have added two new features to the Google Maps API. Both of the new features are options that can be added to driving directions. First up is Avoid Highways (avoidHighways in GDirectionsOptions). This option, as you might have guessed, will return driving directions that avoid routes that include highways. You can see an example in Google Maps Samples here. Secondly, you can now also provide walking directions (G_TRAVEL_MODE_WALKING in GDirectionsOptions). Google have provided one caveat, that is walking directions are only supported if you have supplied a div in the GDirections constructor; this is used to display a warning to the user in the turn-by-turn textual directions to the effect that walking directions are in beta. You can see an example of walking directions in the Google Maps Samples page here. Via: Google Geo Developers Blog: Walking Directions + Avoid Highways = My Kind Of Driving! 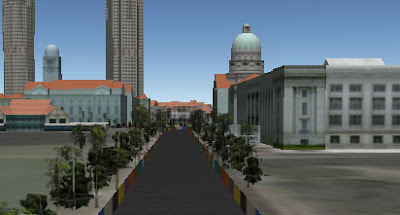 Weisswo PinPoint is a German based Google Map creation tool that enables anyone to create their own Google Map mash-up. The creation tool comes with a number of useful features, including custom icons, driving directions, clustering, search, database connection and web site embedding. This website, operated by the German publisher Kommunalverlag, is an on-line database for about 5,500 bus operators, who use it to plan their bus tours in central Europe. 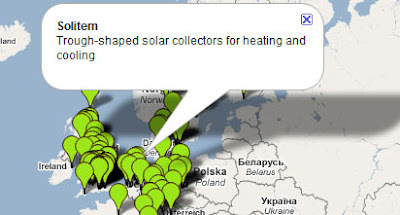 Thanks to PinPoint the site has been able to create a Google Map showcasing points of interest throughout central Europe. This Google Map tags the 690 European distributors for furniture manufacturer Streich. The Regiocard is an access card for different leisure facilities in Tyrol, Austria. This Google Map shows the location of the winter and summer leisure facilities that accept the card. The map comes with a handy legend so visitors can select to view only the activities they are interested in. This Google Maps shows the location of gas stations in Germany. 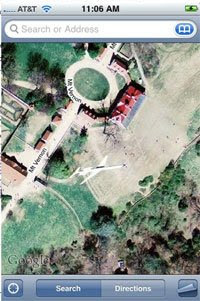 This map demonstrates PinPoint's ability to display photographs. The map showcases a number of locations in Austria. When a map user clicks on one of the points of interest a lightbox opens displaying a photograph or a video of the location. BMW-Austria are using PinPoint to geo-tag BMW dealers in Austria. All the dealers are shown on a Google Map and are listed in a sidebar. Clicking on one of the markers opens an information window with the address and phone number of the dealer. This architecture map demonstrates how PinPoint can display images in a sidebar which, when clicked, will zoom the map into the location where the photo was taken. This Google Map mash-up displays the location of a number of golf courses in the Alpine region of Austria and Switzerland. When you click on the marker of one of the tagged golf courses an information window opens with the contact details of the course. Most of the information windows also contain images, which when clicked open in a lightbox. Google have today added transit data to New York on Google Maps. Public transit directions are now available on Google Maps for the New York metro region, encompassing subway, commuter rail, bus and ferry services from the Metropolitan Transit Agency (MTA), the Port Authority of New York and New Jersey, New Jersey Transit and the City of New York. 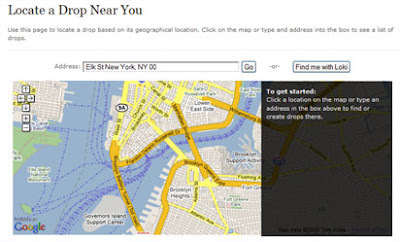 So if you need directions in New York head over to maps.google.com/nyc. The street view icon on Google Maps currently portrays Peg Man wearing a party hat and three balloons. Is he celebrating Stock Market Meltdown Day? Perhaps he is celebrating Google's 10th birthday? Or perhaps he's a few months late turning up to pose for the street view car's snapping of Google employees at the Googleplex. The street view icons in Japan and Australia are also similarly attired in their best party clothes. However the French Monsieur Peg Man is still racing the Tour de France two months after the rest of the riders packed up and headed home. Google is planning to unveil the Android phone tomorrow in New York. Android phones are capable of running Google Maps and therefore should lead to an explosion in location-aware applications for the mobile phone. Cab4me shows your current location on a Google Map and attempts to find your nearest taxi provider. Cab4me is currently in private Beta testing. Locale will allow you to set your phone's setting based on your location. For example, you can define your work space and configure your phone's settings to vibrate only when you are at the office. Piggyback is a real-time carpooling application that helps you save time and money while reducing your carbon footprint. 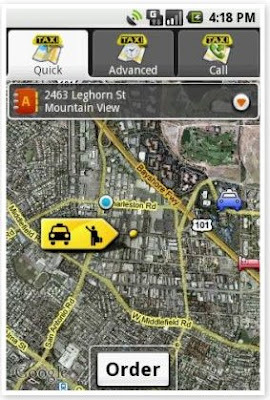 Piggyback can map your driving patterns to help you find passengers more easily and more regularly. Breadcrumbz will let you navigate your route using pictures. It will be like navigating using Google street view but with static images instead of panoramas. The application also plots your route on a Google Map. PhoneBook 2.0 organises your contacts, notifies you when they are online, displays reminders when a birthday is coming and helps centralise all communications. The application uses Google Maps to show the current locations of your contacts. Ecorio will run in the background of your phone and track the journeys you take. It will then tally up the trips you take each day so that you are aware of your carbon footprint. If you select one of these trips you will be shown how to make the same journey using public transit, if available. You can also see the carpools that are available for that trip. ShopSavvy is a shopping assistant for your phone. To use ShopSavvy you scan a product's barcode with your phone's camera and view all the best prices online and at nearby, local stores. The application uses Google Maps to show the locations of stores where you can buy the product cheaper. Pocket Journey is a mobile social exchange that connects you to location-specific knowledge so you can quickly know everything about anywhere. The application plans to provide Geoclips, short, category specific text, audio and video clips designed to capture the highest quality knowledge about a specific location by those who know the location best. Beetaun is a social network based on geographical content. Beetaun uses Google Maps to show the geo-related tags of other users. Beetaun will therefore help you to find out the places that other people liked at any location. Commandro is a mobile social network that will organise, display, and manage location-based information. Commandro also plans to organise active outdoor games based on your social network. The Android Developers Blog has a good open source example of an Android app mashing up Google Maps with Panoramio photographs. The post even runs through how the MapView was added to the app. Drop.io is a file sharing / storing site that allows users to store and share pictures, videos, audio, documents etc. without having to register or give an e-mail address. Drop.io utilises Google Maps so that users can add a location to an uploaded file. Provide an alternative to URLs (instead of something like drop.io/klkvas2, try "go to the front door of your house," plus, it's a lot easier to remember "the corner of 23rd and Broadway" than a URL). This Google Maps mash-up from the United Nations Environment Programme showcases 187 sites around the world where humans are having an adverse effect on the environment. The primary focus of the map is on environmental trends over the last 30 years. The map uses illustrations, satellite images and ground photographs to highlight the impact of humanity on the planet. Green Map Systems are attempting to organise a diverse global movement of local map making teams who are charting their community's natural, cultural and green living resources. 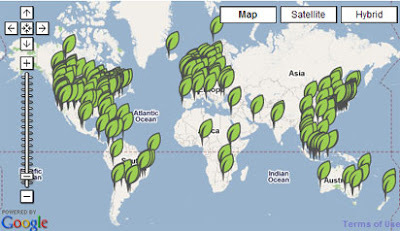 Green Maps are created by local map teams in over 50 countries. Green Map hosts a meta-map plotting all the local maps on one Google Map. The local projects are tagged on the map with an appropriate leaf shaped marker. The tags contain links to the websites of the local green projects. Climate Atlas hosts a large number of interactive maps demonstrating the effects and the projected effects of climate change. Here are just two of the maps. Visit the site to see many more. Renewable Energy Map - this map shows renewable energy sources in the US. This map is not plotting global warming but it can tell you the current climate in any country in the world. To check the climate data of a particular country the user drags a marker over the country on the map. Then the map returns a calendar showing the precipitation, temperature and wind speed in the country for each month of the year. Google Maps are now only using TeleAtlas map data. Google Maps, the Google API and Google Maps for Mobile now all use the same underlying map data. The only exception is Israel where Google still use GISrael in Google Maps and Leaddog in the Google Maps API. On September 13 the Swift Satellite recorded the electromagnetic radiation of a high-energy explosion that took place 12.8 billion years ago. This is the oldest and furthest gamma ray burst ever recorded, from when the universe was only 7% of its present age. Ogle Earth has created a Google Earth KML file containing an image overlay of the burst. You can view the file in Google Earth or you can view it in the browser based Google Sky. To view the overlay in the browser version of Google Sky right click on the kml link, copy the link location and then paste the kml link into the search box of Google Sky. Outside.in, a website that aims to bring you the latest news and opinion in your neighbourhood, has this week launched StoryMaps. 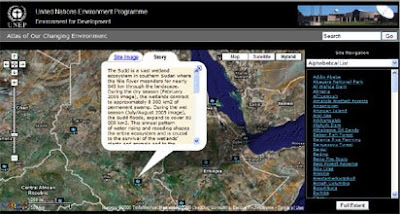 A StoryMap is an embeddable widget that lets bloggers organise and present their posts geographically. So, for example, if a blogger writes about a local restaurant or a local meeting the post will be geotagged on their StoryMap. 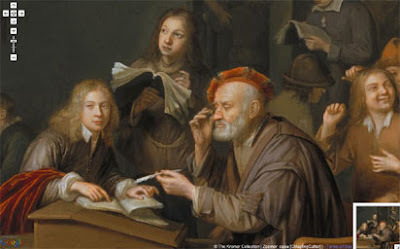 The blog's readers can now access the story on the blog in the normal chronological way or via the StoryMap. Five months after launching a Street View section Google Earth Hacks has added its 2000th interesting Google Street View. TripIt, the personal travel assistant that automatically organizes all your travel plans, has reached its one year anniversary. TripIt has a new Blog Badge that makes it easy for bloggers to display their TripIt travel plans with their readers. It automatically displays your current location and upcoming trip destinations on your site. Just last week Google Maps Mania reported on lat49's new ads for Flash based maps. This week we are happy to report that lat49 is also celebrating its one year birthday! If you want to know what it will look like after the spiders inherit the Earth check this out. I, for one, welcome our new arachnid overlords. Google Sightseeing managed to spot this UFO attacking Tokyo. I, for one, welcome our new red saucer flying overlords (sorry spiders). 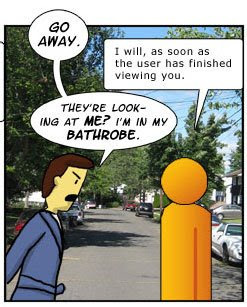 This comic from the If I See Something blog is hilarious. Go check out the whole thing. I promise you won't regret it. I, for one, welcome our new Google overlords (sorry aliens). The Register have put together this map of street car sightings. Each sighting is accompanied by a photograph of the street view car! Virtual Globetrotting are running a Google Street View scavenger hunt. The prize is a copy of Off the Map, the US edition of the Google Sightseeing book. The competition is to find interesting words in Google Street View. Are you looking for a good local restaurant? If you are the best place to look is often your local newspaper. All the Food That's Fit to Print is a Google Maps Mash-up that has geo-tagged hundreds of newspaper food columns. So now you can use Google Maps to find the food column of your local newspaper. Google Sightseeing have a fun post today that shows some of the Google Maps street views that have a pirate theme. Clean Up the World is a global campaign that inspires communities to clean up, fix up and conserve the environment. Held in partnership with the United Nations Environment Programme, it mobilises an estimated 35 million people across 120 countries. Clean Up the World Weekend is scheduled for September 19-21. It is a global public service initiative that encourages people to come together to clean up and fix up local parks, beaches and trails. Google is serving as the technology partner this year, providing Google Grants funding as well as consulting services for the My Maps and Google Maps API components of the site. The Ramsar Convention is an international treaty for the conservation and sustainable utilization of wetlands. 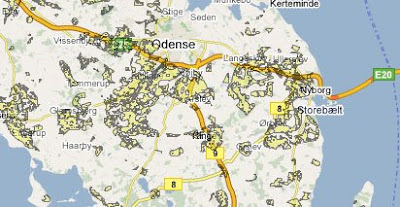 This Google Map shows the Ramsar sites for Denmark. The 27 areas range over 7400 km2, and are all nature protected regions. This map was created by Soren Johannessen using CASA's GMapCreator to convert ESRI shape formats into PNG tiles. This map shows where there are high concentrations of nitrate in Danish drinking water. This does not mean the water from these areas can not be drunk, but the Danish authorities have to be very carefully in these areas and often have to control the quality of the drinking water. The data for both mash-ups comes from the The Danish Nature & Environment Portal where lots of Danish enviroment data can be downloaded. The Guardian newspaper in association with Library House have produced the CleanTech 100 list, a list of what they consider the top 100 private companies in Europe involved in clean technology. This Google Map shows where each of the companies is based. This is a map I developed myself by running the company locations through batchgeocode's geoconverter and then using the Google Spreadsheet map wizard. It took about 20 minutes. Acheibr is a Portuguese language Google Maps mash-up of Brazilian places in the US. The site tags Brazilian restaurants and other Brazilian businesses operating in the US. It is possible to search the businesses by location and category. The results of a search are tagged on a Google Map and listed in a sidebar. 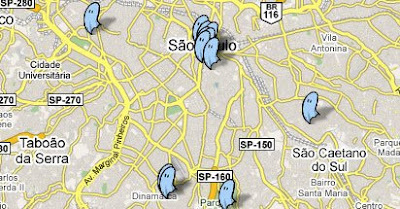 Apparently there are quite a few ghosts in Sao Paolo. 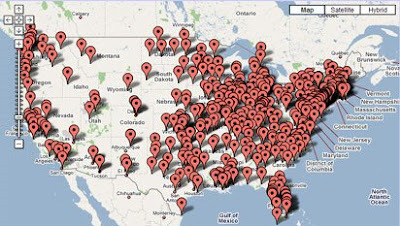 Luckily Bogomaps has created this map of all the haunted places. 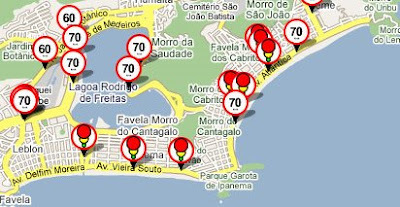 This Google Maps mash-up has geo-tagged over 2000 traffic radars in Brazil. The radars are tagged on the map with markers that display the speed restriction at that location or a set of traffic signals if the radar is located at a junction. This map of cultural hotspots in Brazil has many search options. Each tagged marker comes with a lot of information (many with rich content, such as photos, audio and videos). It is also possible to export the search results to CSV and to Google Earth. This mash-up is a map of telecenters in Brazil. This map is a mash-up showing the location of community radios stations in Brazil. Mapa GLBT is a map of gay, lesbian, bisexual and transexual associations in Brazil. Street View is now available on your mobile phone. And so are walking directions! Check out the Google video (starring Peg Man). This is a video of the keynote speech at the Google Developers Day in London. About 21 minutes into the video Mike Jennings demonstrates a working Android mobile phone for "the first time in Europe". As part of the demonstration Jennings browses Google Maps on the phone. Travelzoo, a site that aggregates cheap travel offers, has today announced a new Google Map mash-up to allow customers to find cheap travel deals. The new search tool, called 'Deals Near You', is designed to help travellers find relevant travel deals near a specific location. 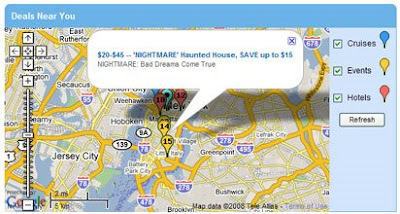 It is also possible to use the map to find show and event deals near your chosen location. 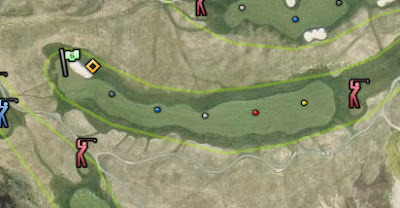 To use the map you first use the 'change location or range option' to set the area you wish to search. It is then possible to refine your search options by choosing one or more of 'events' 'cruises' of 'hotels'. Travelzoo then tags your results on a Google Map and provides a useful list of the search results under the map. Clicking on the tagged results opens an information window that contains a brief description of the deal, the price and a link to the offer's main page on the Travelzoo site. The site is very useful in finding cheap deals for shows and events near your home. Or if you are planning to visit another city it is a great way to find cheap hotels in a specified area. Google Maps mash-ups of Google Sky come along very rarely so I was very excited to discover this mash-up of Google Sky with the SIMBAD Astronomical database today. What makes it even more exciting is that it is an awesome accomplishment. In design and interaction this mash-up resembles Google's own web based Sky. However it is so much more than Google Sky. When you search for a celestial object in Google Sky you are shown the resulting map tiles in your browser. 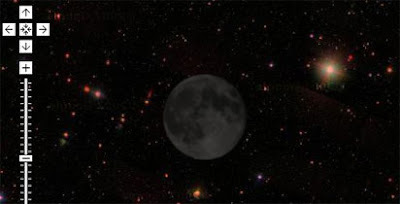 If you undertake the same search in the SIMBAD Astronomical Database and Google Sky you not only get to view the stunning imagery of Google Sky but you receive all the data available from the SIMBAD database as well. Mapperz has contacted me with some other interesting Google Sky news. First off, Google Sky is now localised so non-English speakers can browse Google Sky in their own language. For example, here is the Turkish language Google Sky. Secondly, there are two examples of Google Sky mash-ups in the Google Maps API Demo gallery. One, by Pamela Fox, is a demonstration of all the different planetary types available in the Google Maps API. 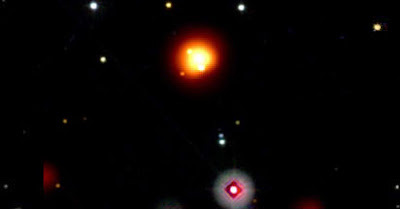 The second, by Mapperz, is an example of an image overlay on Google Sky. The Barnabu blog has produced an interactive Hertszprung Russell Diagram map of 3000 nearby stars. The map uses the Goolgle Earth plug-in to portray a scatter plot of stars’ luminosity vs colour. The map displays 3000 nearby stars from the Hipparcos catalogue. 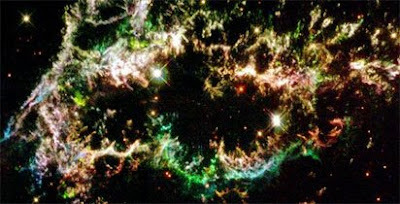 The European Space Agency's Hipparcos satellite operated for four years between November 1989 to March 1993 and was dedicated to the measurement of stellar parallax and the proper motions of stars. HeyWhat'sThat is a website that generates a horizon view for any given location. The site includes the option to open a 'Sky' view that overlays the celestial sphere with the horizon, visible summits and an azimuth-altitude grid for that location at the current time. HeyWhat'sThat also uses the Google Earth browser plug-in to portray the night sky. 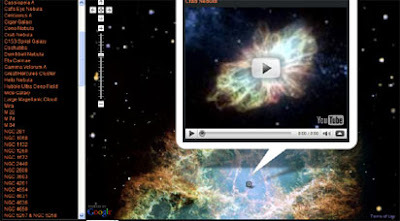 This is my own mash-up of Google Sky and videos of celestial animations from the European Space Agency and YouTube. A number of celestial objects are presented in a right hand menu. If you click on one of the menu items the celestial object is shown on a map of the night sky. If you click on the tagged object a video animation is then displayed on top of the map. Today we have a guest post by Renaud Euvrard, who has been the French contributor to Google Maps Mania since 2006. His blog, Renalid.com, is one of the most important French blogs about the geoweb, "geo"mashups and neogeography. Les 20 meilleurs Mashups français from Renaud on Vimeo. DisMoiOù ("TellMeWhere") is much more than a directory. Social website, DisMoiOù can also find the right addresses proposed and commented by users. My opinion: DisMoiOù offers real interaction between its users. Nomao is a simple service that allows sharing of events or places on a Google Map. The toolkit is perfect if you wish to inform your family or community of your favourite places. Panapa allows users to share the places they love or that they find useful. This may be a place for a picnic, parks or art galleries. Panapa uses tags and other feeds on a simple interface. My opinion: The interface is simple and effective. The objective of NavX is to give users of GPS navigation, the ability to create, organize and share geolocated content. My opinion: A great mash-up, Navx is a website that uses the Google Maps API for Flash. Urbamania is a site where users can share the places they have discovered (restaurants, shows, movies, ..) with the community and the results are directly displayed on a map. Urbamania integrates Google Maps to display each place and event. PiliPili is a website that displays addresses, events and good plans (coupons) in your city (in France): Grenoble, Lille, Lyon, Rennes, Strasbourg and Toulouse. The site has a nice interface where the screen is used efficiently. The MonsieurParking.com website is devoted entirely to rental parking spaces. Using the site it is very easy to find an available parking space that matches your criteria. AlloGarage.fr is a website guide that helps motorists to discover garages from the testimonies of other motorists. The garages can be ordered through the advice of others and this allows car owners to avoid scams. More than 12,000 garages are referenced. Only moderate opinions and objectives are published. My opinion: There is simple and clear presentation of the results using Google Maps icons highlighting each garage. A great achievement! V-Trafic is a mash-up of Google Maps which brings together a number of different application data : national traffic in real time, weather, webcams, news info (partially visible after registration). My opinion: The essential information is immediately accessible. Originally called monvelov.com, then unvelovite.com, this mashup allows you to locate and view real-time availability of "velo'v" in Lyon (free availability of bikes). Developed initially by Jean-Louis Baudoin, a passionate developer, the site was taken over by the official website of "velo'v." My opinion: a mashup pioneer, very well done, providing a real service to its users. VeloInTheCity aims to facilitate the use of bicycles through a free service. An interactive Google Map can locate stations for free bicycle service in the cities available (Velib', Vélo'v, Le vélo, Vélo Toulouse, Velam, V'eol, Vélo à la carte, Bicloo, Vélos jaunes, BIP!, Vélocité-Besançon, Velodi, Velo'+). My opinion: a complete site in its category with an interface which really works! Zilok is a new concept, a rental market, where anyone can rent any property. 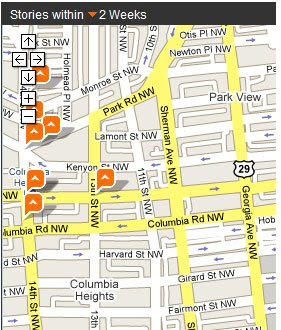 All searched property is tagged on a map where you can refine the search to view only the results near your location. My opinion: A great integration of a streamed GeoRSS allows for real-time research. Like Trivop, TVTrip is another player offering video guides for hotels. TvTrip offers a video guide for hotels in Europe to bring transparency to the preparation of your journey through video reviews. A number of hotels in major cities in Europe are available (3 stars minimum). TvTrip hotel reviews are "independent and objective". My opinion: As with Trivop, I like the integration of video directly into Google Maps. Rollers & Coquillages is an association that organizes a famous weekly roller in Paris on Sunday afternoons from the Bastille. Their site offers an interactive Google Map highlighting the next week's route. This site lists more than 2000 mountain bike routes (over 80000km!) in France (and neighbouring countries) proposed by riders through their GPS (tools increasingly riders or hikers). 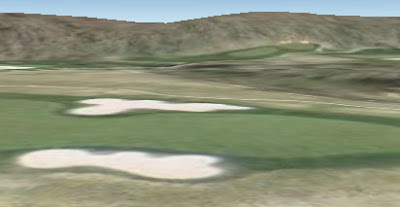 All courses are visible on a Google Map, and Google Earth via the browser plug-in ,with plenty of information (indications on the spot, comments, photos…). My opinion: a wealth of information for hikers to mountain bikers. Keltoa is a community portal and a social network for real estate. Keltoa have developed a real estate community, where individuals and professionals can exchange ideas and meet. The search for property contains advertisements, sales and rentals coupled with Google Maps, to explore a district's centres of interest or amenities (markets, nurseries etc…). My opinion: Keltoa offers a simplified search. The interface is efficient and enjoyable. BmyKey is a French property mashup with a nice design that integrates Ajax, comments, rating, rss, and widget. You can use the site to look up facilities and services near the property concerned (schools, doctors, shops, nurseries, etc)! My opinion: BmyKey is a website with a clean and very accessible interface, offering flexibility of use. SeLoger.com, the No. 1 real estate site on the Internet in France, has established a very interesting mash-up of property and Google Maps. The mash-up display real estate prices and their evolution in real time on the basis of prices for the sale of over 600,000 properties. Immoplaza is another site of real estate ads. Like its competitors, the site offers users as much information on property as on their environment. Incorporating a dynamic map, Immoplaza can, in addition to locating properties, indicate a range of information about the district, such as the success rate bachelor, proximity to nurseries, video or supermarkets. My opinion: I appreciate the simplicity of design and clear access to information. My opinion: It is rare to see a mash-up gather so much information.